New Orleans, Oct. 3, 2016 – In advance of the annual MMOPA Convention, Hartzell Propeller released special pricing for the company’s five-blade composite propeller designed specifically for the Piper Aircraft Meridian and Piper’s new M500. The Malibu/Mirage Owners & Pilots Association (MMOPA) convention begins here Oct. 5-9. The $49,000 list price includes the new five-blade Raptor™ light weight hub, ASCII Carbon fiber blades, compatible de-ice equipment, new polished spinner assembly, gust lock covers and full STC documentation. The new Hartzell Propeller blades are certified for unlimited life, and are five to 10 times stronger than wood core blades. They feature a stainless steel shank, nickel cobalt leading edge, and mesh erosion screen for FOD protection. 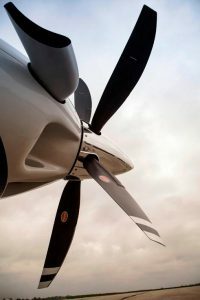 Hartzell’s latest Piper five-blade design is 15 pounds lighter than the current factory installed aluminum four-blade propeller and 10 pounds lighter than similar wood core propellers. Hartzell’s new Meridian composite prop boosts climb performance, and decreases noise, while offering impressive ramp appeal. The exceptional durability of the ASCII Carbon design and all around superior performance make it the perfect propeller for the Turbo-Prop M Class Pipers. As such, the Piper factory offers the new propeller as a premium option on new M500 aircraft. The Piper M500 features the latest in Garmin G1000 avionics, enhanced safety features, and a number of other significant product improvements. The six-place M500 is powered by a Pratt & Whitney PT6A-42A 500 shp engine, sports a 260 KTAS / 482 km/h max cruise speed and has a range of 1,000 nm / 1,852 km. Equipped with an improved Garmin G1000 avionics suite featuring the most advanced safety features available in any single engine turboprop aircraft, the 2016 M500 is listed at a competitive price of $1.99 million.